Times are changing and with the rise of mobile devices and constant interconnectivity, it’s no longer necessary to make a six-figure salary to start investing. A number of startups have developed platforms that make it easy for average wage earners to invest. 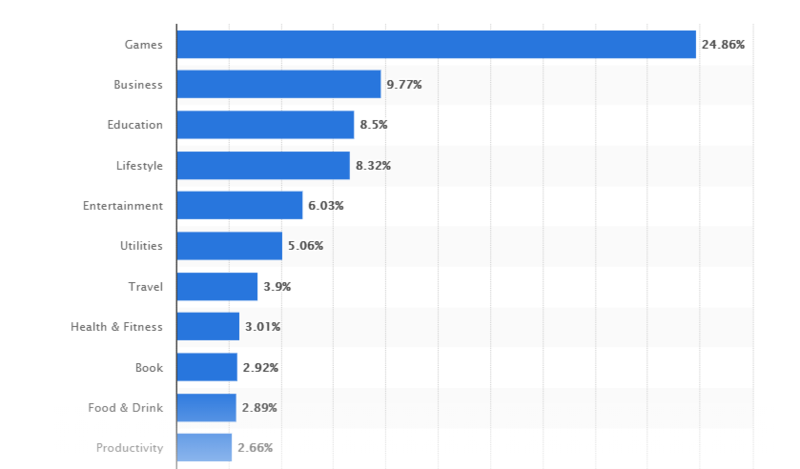 According to Statista, as of September 2018, business apps were the second-most popular category on Apple App Store, with a share of 9.77 percent of all active apps being business related. Below are some of the apps you can download and start investing now. Robinhood lets you learn to invest in the stock market for free. This is an app built around one promise: no-fee stock and cryptocurrency trading. 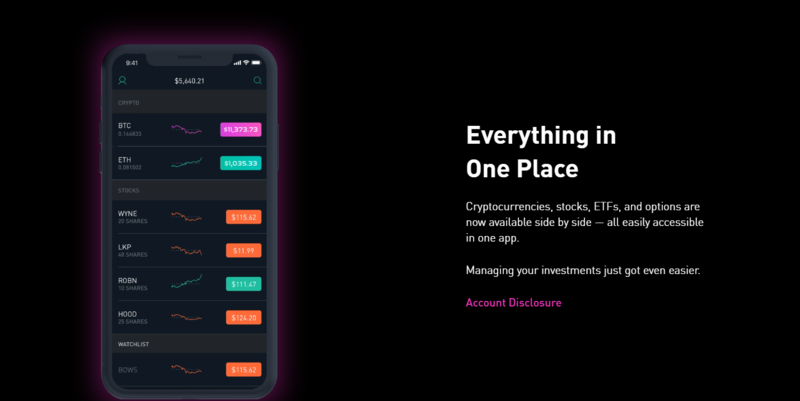 Robinhood seeks to democratize access to the American financial system. The investing platform lets users buy and sell stocks, exchange-traded funds, options, and cryptocurrencies, all commission-free. Robinhood offers three types of accounts – Robinhood Instant, Robinhood Gold and Robinhood Cash. To make an investment, users first need to choose a company they believe will be successful. In February 2018 Robinhood began offeringcommission-free trading of Bitcoin and Ethereum to users in California, Massachusetts, Missouri, and Montana. It has now expanded its crypto trading to a number of other U.S. states, the latest being Ohio. Acrons believes anyone can grow wealth. Acrons puts your money into preconfigured portfolios that were allegedly created by the Nobel Prize-winning economist Harry Markowitz. There are no costs for opening an account on Acrons, but $5 are needed to start investing. 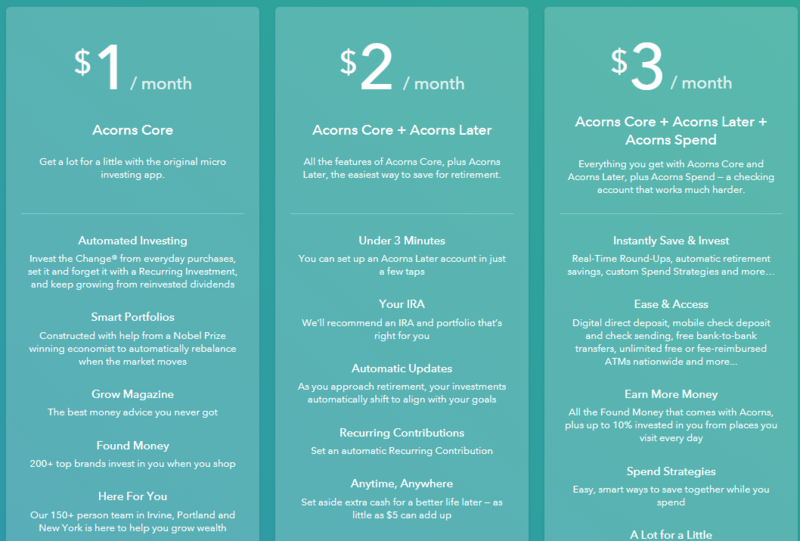 The platform offers two ways of investing – Acorns Core and Acrons Later. Acrons Core is a micro-investing account that allows you to invest spare change. Acorns Core has partnered with several hundred brands thanks to their Found Money feature. It credits your account when you make a purchase from a credit or debit card linked to your Acorns account. Brands that have joined Acorns and its Found Money feature include Nike, Airbnb Apple, Expedia, Sephora, and Stitch Fix. Acorns Later is a way to save for retirement. Acorns is free for four years for college students with a valid .edu email address. Other investors pay $1 a month for a taxable investment account and $2 a month for an individual retirement account. Stash is an investment platform with a mission to give everyone access to financial opportunities. It allows anyone to become an investor in just two minutes with as little as $5. Unlike Acorns, which actually does the investing for you, Stash simply makes investment recommendations, leaving it up to you to actually place money. Stash is best for investors who want guidance selecting instruments, new investors, and thematic or impact investors. The service charges $1 a month for account balances under $5,000 ($2 per month for retirement accounts under $5,000) and a 0.25% annual fee for accounts with $5,000 or more. Wealthfront is for those who want to use passive investment to build wealth. Wealthfront is a robot-advisor that places your investments based on an algorithm after you complete a questionnaire about how comfortable you are with risk. “If you try to do things yourself, you’re never sure if you’re making the right decisions. If you use advisors, you’re never sure whether they’re making the best decisions for you... or for themselves,” the post on the platform’s website says. 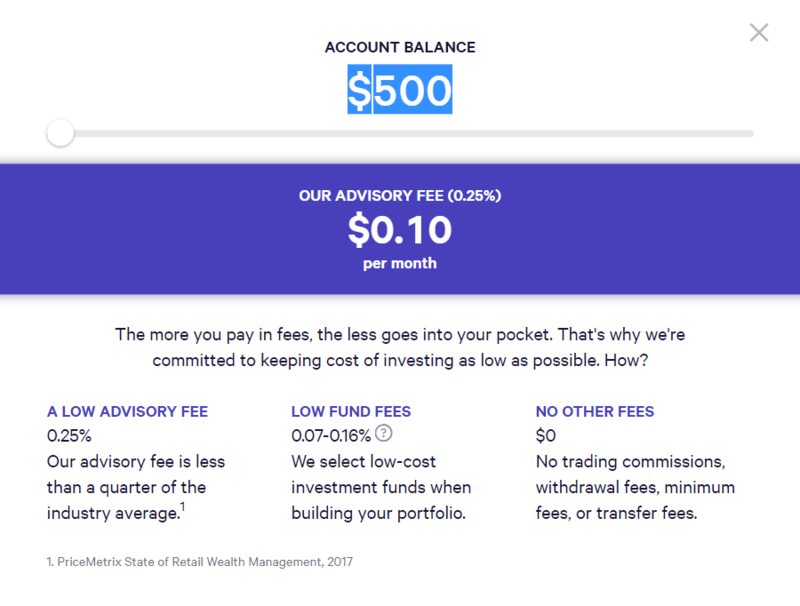 This is how Wealthfront works: You invest a minimum sum of $500 into a Wealthfront account, and the platform allocates your investment into assorted ETFs. Wealthfront’s portfolios include a mix of U.S. stocks, foreign stocks, real estate, natural resources, and corporate, municipal, and emerging market bonds. Wealthfront charges 0.25% per year. Betterment is the biggest competitor of Wealthfront, which also charges 0.25% for its digital service. “Betterment is an online financial advisor built for people who refuse to settle for average investing. People who demand better. People like you,” the firm says about itself. Betterment is actually an online financial advisor, which helps plan financial goals and recommend smart investment choices. Betterment has two service options: Betterment Digital and Betterment Premium. The first one has no minimum required and charges 0.25% of managed assets annually. Customers in this offering can consult financial advisors via in-app messaging. Betterment Premium provides unlimited phone access to financial advisors in exchange for a 0.40% fee and $100,000 account minimum. Stockpile is essentially two businesses under one umbrella: a regular brokerage business and a stock gifting service. Stockpile allows to buy an entire share of stock or a fraction of 1,000+ stocks and ETFs. There are no monthly fees and all trades are 99 cents. Stockpile also makes it possible to give an e-gift or physical gift card redeemable for stock. Stockpile doesn't allow you to buy companies trading below $6.00, so if you want to trade penny stocks, you should look elsewhere. Kids and teens can use Stockpile by opening their custodial trading account with an adult. They can check their stocks 24/7 and even place trades that go to the adult’s smartphone for approval. 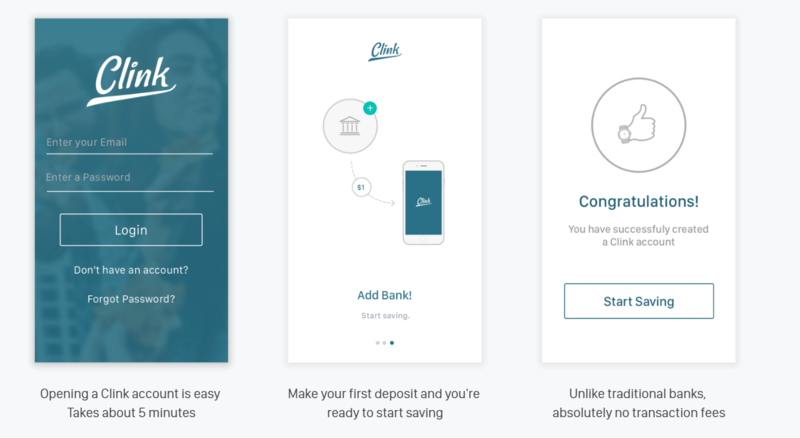 Clink is a microsavings app that aims to help Millennials by making saving and investing simple. Clink helps you save and invest regularly into your own diversified portfolio. Based on the goal you want to save for, Clink will recommend a schedule. To use the platform, simply link your bank account to Clink mobile app, set a savings schedule, such as $15 per week or 10% of the price of each fast food order you purchase. Clink costs just $1 per month up to the first $5,000 managed and 0.25% of assets under management thereafter.